Kristoffer Touborg says his overwhelming interest is in League of Legends' competitive scene. Quick! We need a new designer for our fantasy MOBA: League of Legends. Who do we get? How about the lead designer of a science-fiction MMO about spreadsheets? Probably not the way it went down, but nonetheless, Eve Online lead designer Kristoffer Touborg has announced his plans to quit CCP to work for League of Legends developer Riot Games. Touborg, who joined the Eve Online team five years ago, made the announcement via his public Facebook page, writing that "It's been an incredible five years, working for a company I love, on a game I love," adding "You can't do the same thing forever though. So I'm packing my bags again and moving to Dublin, where I'll be joining Riot games to work on League of Legends." 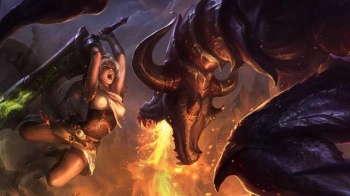 Touborg will be moving from Iceland to Dublin, Ireland, where the European branch of Riot Games is based. He stresses that this move has nothing to do with his employer at CCP, telling us that "Not a lot of people get that opportunity, but I did and I'll always be grateful that CCP let me work at a place where I'd get up every morning and be happy to go to work." He didn't offer any details about what exactly he'd be bringing to League of Legends, but did tell us that "A few years ago, my overwhelming interest was the Eve universe; now it's League of Legends and the competitive scene there," suggesting he'll have something to do with the competitive side of the game.